The use of laser cutting technology is increasing in industrial manufacturing applications. In this process, the output of a high-power laser is directed using optics and computer numerical control (CNC) by moving either the beam or the material being cut. Depending on the power being used, the focused laser beam then either melts, burns, or vaporizes the material, leaving an edge with a high-quality surface finish. 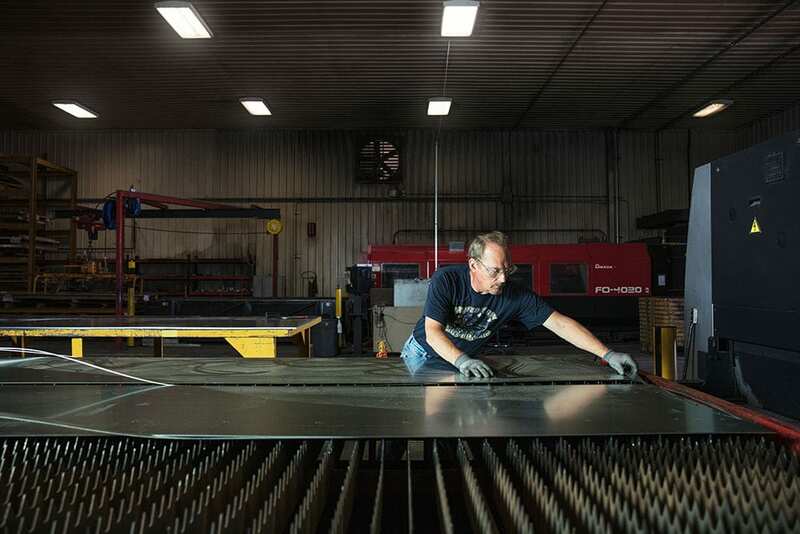 At our Edelstein, Illinois plant, Fibrebond is taking advantage of this innovative technology by utilizing an AMADA laser cutting system for sheet metal fabrication. Traditional sheet metal shearing and hole punching processes leave a lot of room for error. To ensure high-quality sheet fabrication for our customers, we made the move to a laser cutting system. The results were immediate. The increased cutting speeds offered by the AMADA laser cutting system increased the capacity of our sheet metal fabrication department. And since the system makes a direct connection to our product design software, the laser produces a higher quality cut with greater accuracy. This has significantly reduced the error rate when compared to the traditional shear process used in the past. Best of all, the system allows Fibrebond the flexibility to cut a wide range of materials, from galvanized steel to aluminum. Today, all the enclosures built in our Edelstein, IL plant are run through the AMADA system. AMADA laser cutting uses the latest advances in laser manufacturing technology, allowing customers to maximize their productivity and profitability by reducing operating costs. The system has the flexibility to process a wide range of materials like aluminum, steel, copper, and brass with high cutting speeds and increased cut quality. Fibrebond believes in quality, which is why we use the best equipment available, like the AMADA laser cutting system, to manufacture our products. Quality inspections are performed during each phase of production to ensure customer specifications are met. Fibrebond’s manufacturing facility concentrates on production using lean manufacturing principles to reduce waste, ensure quality and consistency, and allow rapid response to critical needs. This helps us meet our goal of delivering a superior quality enclosure on time, at the best value. Fibrebond manufactures and integrates equipment in enclosures for telecommunications, data centers, power and gensets customers. Enclosures are built to intensive standards to stand up to weather, crime, and to ensure that the critical processes they protect can run without problem. At Fibrebond, our employees go above and beyond to assure customers are completely satisfied with our product. Contact us for help with any of your construction needs. To learn more, visit https://www.fibrebond.com/process today.